Before the fall of the Taliban in November 2001, 27 million Afghan citizens had to make do with approximately 20,000 working telephone lines. Domestic connections were spotty, while only a handful of expensive satellite phones could dial internationally. 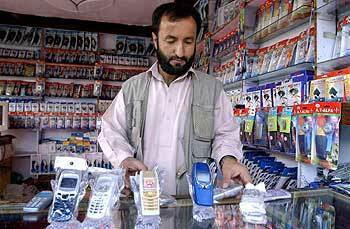 Today, through the extraordinary efforts of the Afghan Wireless Communication Company and its parent company, Telephone Systems International (TSI), more than 300,000 citizens subscribe to the Afghan wireless network, with coverage in twenty cities and an additional twenty cities slated for service by the end of the summer. This digital network “leaves no part of Afghanistan untouched,” according to Bayat, who adds “by the end of the summer, we will have three-quarters of the nation covered.” The speed with which TSI and Afghan Wireless have been able to build the mobile network has made it the provider of choice for government agencies and businesses, especially in and around Kabul. Afghan Wireless provided the communications support for the Loya Jirga meetings that formed the interim Afghan administration, and opened Kabul’s first-ever public Internet cafe in 2002. The police and fire departments in Kabul have received free telephones for emergency service support. The television station already employs more than 50 Afghans, who have created at least three months of programming ready to air. Live news will be broadcast several times a day in Dari and Pashtu, the two official languages, and documentary features on warlordism, poppy production, crime, and the upcoming parliamentary elections are being produced.